Last month marked our seven year anniversary of moving to the UK from Houston, TX. The past year has been something of a challenge for us, as we've struggled with deciding if we are staying more-or-less permanently, or jumping ship and going back to the States with no definite jobs or plans. Some of this was driven by Himself's dissatisfaction with his job, our worries about secondary school options for Devil, and questions about whether could find a job that would contribute significantly to the household income and give us a few more options. Because, let's be realistic: I am not getting rich selling fibre or knitting patterns or tech editing. Not many people are, and its been something my other half and I have been struggling with for quite a while now. But over the past few months a lot of things have changed. Dev got into her top choice secondary school. Himself offered to take a package in a recent round of company layoffs and ended up with a promotion instead, one which is addressing many of his concerns and giving him new opportunities, so he's a lot happier with his job. And last week I was offered a job on a new career path, one that uses my scientific training and background but is new and very exciting And last, but by no means least, we're gaining British citizenship. All of these events coincided with a fibre challenge with my June contribution to the Spinning Box, a sampler scheme just for hand spinners. Each month there's a specific theme, and June's theme was "Natural". Now anyone who's spent any time around here knows that I don't really do "natural" colours in the undyed sense, so this theme put me in a bit of a quandry. Finally inspiration struck: I have a pile of lovely washed brown Corriedale fleece that I've been meaning to card, along with a bag full of washed BFL locks. And since I've been thinking about adding batts to the Porpoise Fur line up for a while, so I decided to do an initial venture into carding with some natural coloured batts. 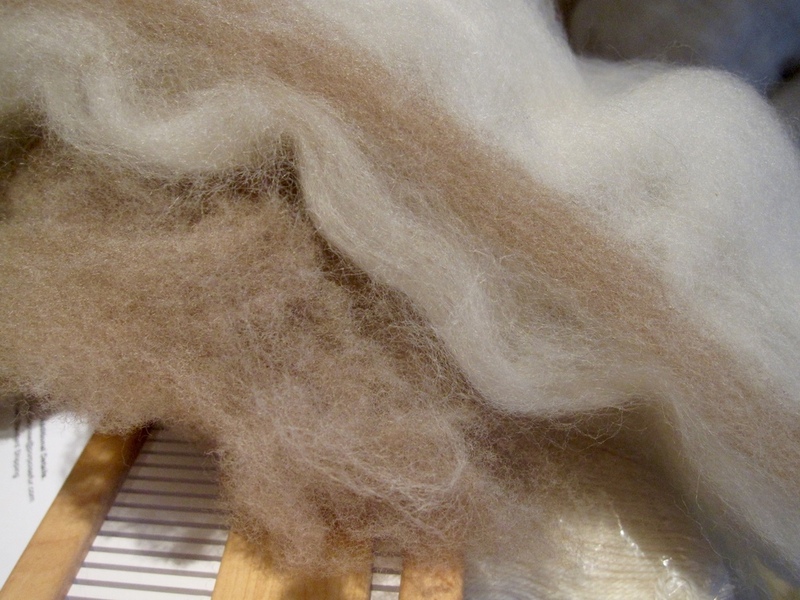 While happily carding away, I had a small epiphany: instead of thoroughly blending the two fibres together as I originally intended, I tried carding them in three layers: one layer of brown Corriedale sandwiched between white BFL. As I peeled the batts off of the carder, I had sudden visions of a wild variety of such batts - semisolid outer layers with brightly coloured and unexpected insides, dark layers around colours that would peek through in the finished yarn, varied combinations that would create unexpected finished yarns. Having spent some time playing with the carder, and working with a couple of other colour options, I'm thrilled to announce the launch of a new product at Porpoise Fur: Victoria Sponge Batts. Named for the resolutely British cake, to celebrate my new status as an official Brit, these batts will be available in small batches from the next shop update. There won't be repeated colourways as such for these, unlike the dyed tops; I'm going to use this product as an opportunity to really step outside my usual recipe-driven process and just play with colour. Lots and lots of colour. I hope you'll join me on this new adventure - I think it's going to be amazing!